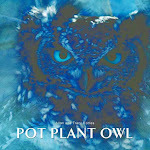 Pot Plant Owl: 1st September and PPO arrives..
1st September and PPO arrives.. It's official. On this first very warm day of Spring, Pot Plant Owl is comfortably sitting in the pot plant. This morning we woke up early and checked the balcony for any signs of our owl visitors. The sun was just rising and there seemed to be no owl in sight. A few minutes later, I happened to look on the balcony again. And there she was - standing on the balcony railing staring straight at me. I knew immediately that PPO wanted to move in and nest, so I quickly hid out of view. No sooner had I done that, I heard a murder of crows on the rooftop nearby. The crows were perched on the edge of the rooftop - staring in the direction of Pot Plant Owl on the balcony railing, waiting to attack. I stuck my head out of the window, and in my best immitation of Allan's 'crow-crowing-with-flailing-arms' stunt, I scared the crows off pretty quickly. (Perhaps 'scared' is not the correct word. They were probably not the least bit afraid of me, but thought me too odd to hang around near). With crows away, I turned my attention to PPO again. The little stinker! While I was protecting the territory, she seized the opportunity to settle down into the pot plant container. But hold on - that's not the 'stinky' part of this tale. I know that PPO knows where the cameras and the microphone are. I know that she has sussed this all out long before this morning. I know she, along with Pappa, saw us all puzzling over the best angles and distances for the camera views and sound. And I bet, she sat and chuckled to herself thinking: 'Just you wait, you know-it-all-humans!' - a message that, were I an animal with general telepathic abilities, I would have picked up days ago. What has caused this change of pot plant container? We don't know for certain, but I suspect a lot has to do with the increase in crows in the Jozi area, and in our area in particular. The container she has chosen has a small 'Mickey Mouse' bush in it. She ducks out of sight of crows perfectly. Very close to the container is a reed wall cover which further protects her from the crows. And perhaps PPO wants more cover from our summer thunderstorms. Who knows! Sigh! She's been here for 8 hours and already she's got us running around after her. It sounds as though you are going to have a busy spring, Tracy, if you are trying to outwit a mother owl and imitate flapping crows. I look forward to seeing all the wonders when you are on line. Yay! Can't wait! Fire up the cameras! Who are you calling 'lil stinker'? Picture of first Egg on africam's facebook ! Leave it up to PPO to make her own decision on where to nest! Love your post about where she's ended up. I hope that some of the activities will show up on the camera :-) Thanks for taking such care in making PPO a part of your lives each year. "Little stinker" already keeps you busy and makes us happy.